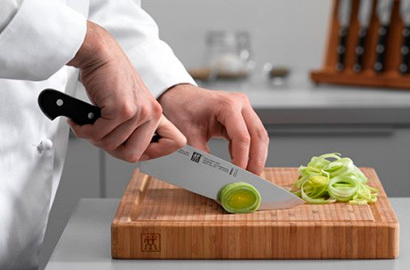 A KNIFE FOR LIFE – USE AND CARE YOUR KNIVES We really care about our high quality knives. If you do too, you should care for them so they will last a lifetime. You may not be aware of the fact that the wrong surface can easily damage your knife. Because every slice ends on the material you are cutting on. The good news is: it’s not difficult to find a good cutting board. All you need to do is keep reading. Avoid surfaces that can dull or damage your knife such as china, marble, granite, tile, Formica, porcelain, stainless-steel counter tops and glass. Those surfaces can harm the cutting-edge retention. 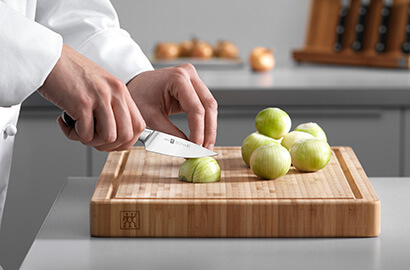 Cutting surfaces should be smooth, easy to clean and "give” on contact with the knife’s edge. 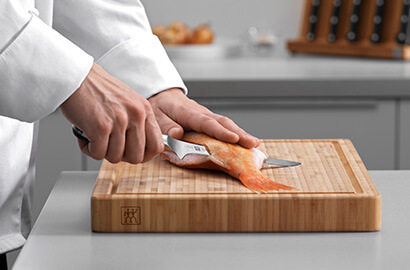 We recommend wooden or quality plastic cutting boards. 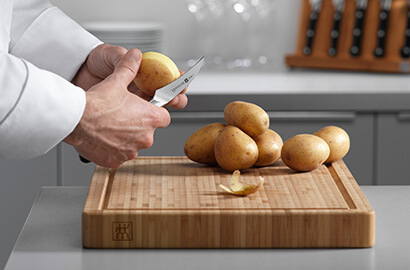 No matter what cutting board you prefer, make sure that you’re cleaning it after each use. 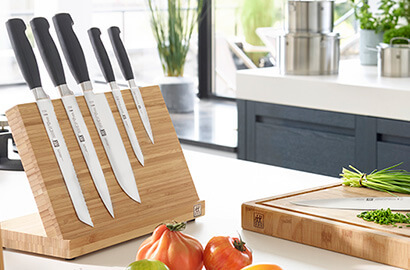 All ZWILLING and MIYABI Morimoto Edition knives are dishwasher safe. However, we do not recommend putting knives in the dishwasher. So you don’t risk shortening their lifespan or worsening their cutting edge retention. Other MIYABI and all Kramer by ZWILLING knives need to be washed by hand. But to be honest: we highly recommend washing all of your knives by hand as it’s gentler on the steel. Clean them under lukewarm water with a mild detergent and a non-scratch cloth or sponge. Then dry immediately. We got it. Sometimes it’s just more convenient to use the dishwasher. And like we mentioned before, that is no problem. But please do not exceed a washing temperature of 130 °F. And try to place the knives separately to avoid impact with other objects. Nonetheless the extremely aggressive cleaning chemicals that are used in dishwashers can damage the surface of plastics and steel. So please take into consideration that your favorite knife may not last as long as it was meant to be. Who doesn’t love lists? We do. At least when the list helps to keep our knives as sharp as they have been on the day they left our factory. No metal is completely “stainless“. So please don’t allow acidic foods to remain on the blade. This may cause some slight tarnishing and you don’t want that. Always clean them right away. If rust spots form on a carbon steel blade remove them with a “Rust Eraser”. Just wet the eraser and rub the spot with light pressure in one direction parallel to the blade’s pattern. Almost done. You can now wipe the blade clean and dry it with a paper towel. Carbon steel knives will turn dark gray or black over time. To minimize this patina, whenever you cut highly acidic foods, rinse, wipe the blade, and then return to cutting. Always rinse and dry carbon steel blades immediately after use. Except meat cleavers, our knives are not made to cut bones. Also do not use knives for poking, prying, separating or cutting semi-frozen or frozen foods. You can do a lot of things with our knives. But please do not use them as screwdrivers or can openers. It’s just not their designated purpose and may result in bending or breaking the blade. 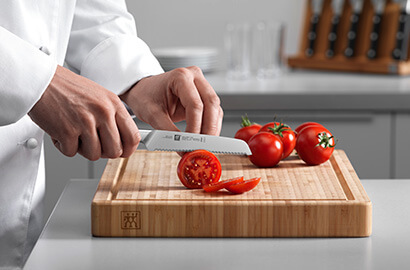 And the ZWILLING J.A. Henckels warranty obviously does not cover misuse. Whatever you want to create, our knives are as diverse as the things they cut. They vary in size, blade shape and cutting edge. These details determine which knife is ideal for which purpose. Keep reading and find the knife that is just perfect for you. Also known as the best way to peel potatoes, fruit and vegetables. And it’s ideal for removing blemishes. The name says it all: this knife is the right choice if you want to clean and slice vegetables. But it’s also ideal for fruit. The sharp tip makes this knife especially good for paring. Besides that it’s perfect for peeling, cutting, cleaning and garnishing fruit and vegetables. Hard shell – soft core. The utility knife cuts cleanly and effortlessly through tomatoes, cheese, sausages, baguettes, and other foods with a hard exterior and soft interior. Boning knives are extra flexible knives with a high-tip blade that is just perfect for loosening bones and removing fat and tendons. Thanks to their extra thin and very flexible blades our filleting knives ensure the easy wafer-thin filleting of meat and fish. Freshly baked bread is one of the best things we can imagine. And the bread knife helps you to cut it in perfect slices. 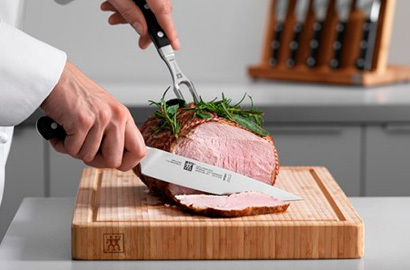 The serrated edge cuts easily through hard crusts and slices thin and cleanly, thanks to its aggressively high prongs. You want to cut smooth slices from large pieces of meat, like roasts? This is your knife! 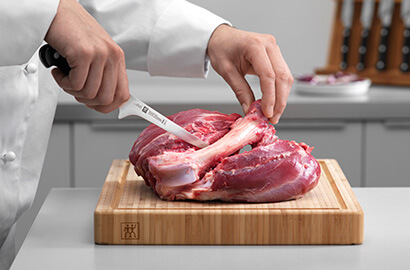 The long slicing knife is just perfect for this job and helps you also to portioning raw meat. The knife for professionals and home cooks. 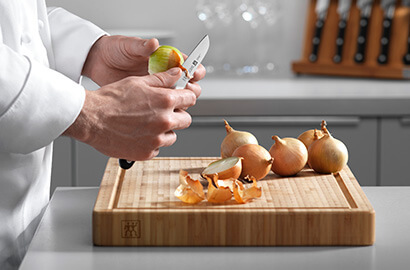 Ideal for dicing vegetables, raw meat and fruit, as well as chopping and cutting herbs. The Santoku knife is the Japanese equivalent of the chef’s knife. It’s perfect for cutting meat, fish and vegetables. There are a number of ways to safely store knives. Here are four of them that we highly recommend. A knife block is not only a really safe place to store your knives—it’s also a very decorative one. 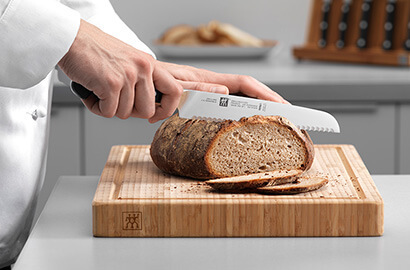 And the ZWILLING SharpBlock can do even more than just store knives. This block sharpens your knives each time you remove them or return them to the block. Nice, right? You can’t take your eyes off of your beautiful knives? We understand. With a magnetic bar you are able to view and easily access your knives. They attach to the wall and firmly hold knives in place. If you are a professional chef, you probably will want a knife case to transport your knives. Make sure you use it with knife sheaths to protect the cutting edge of the blades. A drawer is only a good place for your knives if you use knife sheaths. Otherwise the cutting edge can chip or dent when clashing against other utensils. 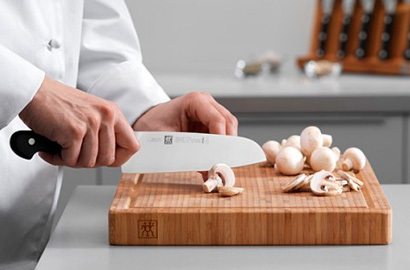 With sheaths, your knives – and also your fingertips – are safe.